San Salvador is in full election mode, preparing for municipal (council) and legislative (equivalent of parliamentary) elections in March. The current national government is the FMLN and is strongly opposed by ARENA. The FMLN president was elected last year for a five year term. The posters of these two and of many other parties are on every billboard, TV commercials are dominated by political adverts and political bunting is hung across the streets by night. From outside, the Cathedral of San Salvador is an imposing, pale cream building with tall windows obscured by wire mesh. As a piece of architecture there is not – in my opinion – much that is attractive. Its one redeeming feature, a ceramic mural facade by El Salvador’s leading artist Fernando Llort, was torn down in 2011 by the current Archbishop, Jose Luis Escobar Alas, creating such a public outcry that the government seriously considered prosecuting him for destruction of a national treasure. In front of the tomb, Ben films Clare speaking about her reactions to the announcement today that the Church has declared Romero a martyr, opening the way to beatification and eventual canonisation as a saint. Find prayers and school resources to celebrate the life of Archbishop Oscar Romero. To the right of the Cathedral’s side entrance there is a wrought iron gate into a small courtyard. Left again, through a pair of huge wooden doors, broad stairs lead down to a cool and enormous crypt. Here the atmosphere is very different from the busy Cathedral above. At one end of the crypt, rows of empty pews are arranged in front of a crucifix, but to the right is the reason that most people enter the crypt – the tomb of Oscar Romero. Find prayers and reflections to celebrate the life of Archbishop Oscar Romero of El Salvador, champion of the poor. The tomb is a new one, inaugurated for the 30th anniversary of Romero’s death. It is sculpted of bronze, with a life-size likeness of the Archbishop lying in state, wearing his mitre and holding his crozier (staff), flanked by four figures representing the evangelists, each holding a Gospel. On the marble slab behind the tomb there is a wooden and silver crucifix and engraved into the marble are the words, “Sentir con la Iglesia*, Oscar Arnulfo Romero y Galdamez, Arzobispo, 1977-1980.” *To feel – or be one – with the Church, was Romero’s motto. Every few minutes another pilgrim or two descends the wide stairs, approaches the tomb and pauses to gaze, pray, take a photo or remember. 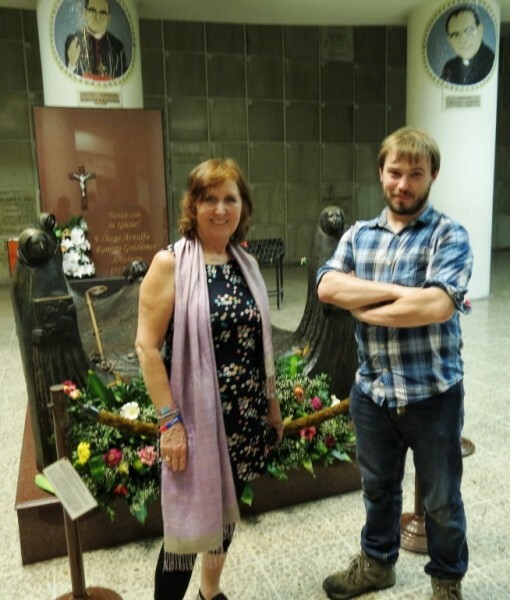 Clare, our translator and Head of CAFOD’s Latin America programme, speaks to one man, Rolando Antonio Gómez Villegas, who tells us how he had come here as a five-year-old with his parents to attend Romero’s funeral. They were only a few streets from the Cathedral when the shooting began and everyone started running for shelter. Previous Previous post: Step into the Gap – preparing for Flame 2!